Over the weekend, actually Wed-Sat night, I was at the Wisteria Cornstalk Festival, a 5-day music event. I had been hired to teach contact improv dance. In addition to music and a handful of workshops, there were a few vendors selling the typical hippie offerings of recycled clothes and tie dyed shirts with Faeries (I did buy a shirt with a woodcut that reads, "Make Art Not War"), as well as stuff for the new hippie phenom, fire spinning. Additionally there were a couple of booths or exhibits that provided environmentally friendly info. 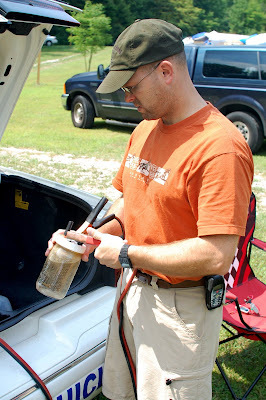 This fellow had brought along his experimental fuel car. I asked him for the story about his conversion and will do my best to relate it here. The car was a garden variety American car - too big and thirsty to be considered fuel efficient in any way. It got about 17 MPG highway before he started working on it. (Aside to the US auto manufacturers: 17 MPG? For a 5-passenger car? You deserve to suffer.) I should also note that 17 MPG thrilled this guy initially because it was replacing a car that got 12 MPG. (WTF? Chevelle SS or some Mopar Hemi like a Challenger or 'Cuda?) ANYway, he did a bit of research and decided to convert his car to run on a mixture of both gasoline and hydrogen. They tell you that hydrogen is hard to come by, but in my high school science class we made it out of water with some sort of electrode in it and an electrical current. What he did was build a three stage setup that fit easily in the trunk. Looking at the image below, I don't see any reason why this couldn't be compartmentalized at one end of the trunk, leaving actual storage space to make a practical car. Looking from right to left, there is an air filter, and two hydrogen generators. The generators are basically PVC tubes with a specially made electrode suspended in it. To the water he added two tablespoons of common baking soda to act as an accelerant to the generation process. Two ordinary car batteries power the generators. You don't see it in these photos but there is a photovoltaic cell mounted to the top of the trunk to charge the batteries. So he hits a switch inside the car to turn on the generators. In just a second or two a bunch of bubbles start flowing off the electrode. The hydrogen gas that is being peeled off the H2O is pulled via vacuum from the gasoline engine out of the generators up to the engine compartment. The hydrogen gas is channelled straight into the air intake, after the filter and before the carburetor or fuel injectors. 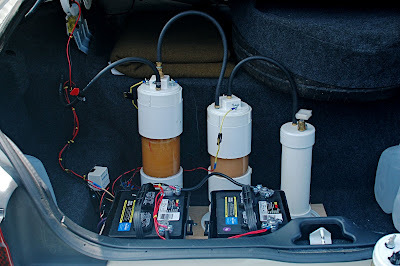 To fool the fuel sensor, he added an electronic device that convinces the car's computer to add less gasoline to the air-fuel mixture, leaning out the gasoline part of the combustion mix. This is compensated for by the highly combustible hydrogen gas that is coming in with the air that is mixed with the gasoline in the carb/injectors. The end result is pretty impressive. His big ol' American pig now gets 32 MPG. A sweet little 88% increase in fuel economy in exchange for about $300 in parts and a weekend of his time. A Toyota Corolla with the same setup would get around 60 MPG! 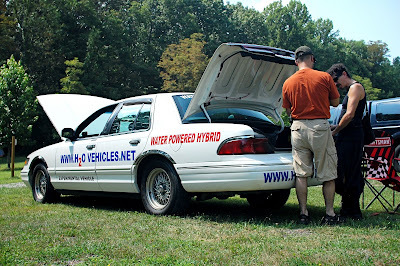 One of the concerns about hydrogen fuel cell cars is that they can be a bit volatile. I didn't ask directly, but since this car is generating only small amounts of hydrogen, and using it as it's produced, I suspect that this minimizes the risk pretty significantly. Making it safe - as safe as having a tank of gasoline in your trunk for example - seems like a solvable problem. Might I also add at this point that Big Oil in America posted record profits this past quarter. Are you mad yet? What's it gonna take to make you quit playing along? I don't have an experimental fuel car, but I do make a conscious choice to use a motorcycle to commute (40+ MPG) and a bicycle to get me to and from my dance classes as often as possible (10 MPC* on average). I have no special right to lecture you, I'm just as caught up in the cycle of stupidity as most Americans. On my desk in front of me as I type is my computer, digital camera and two lenses, a current PDA, good computer speakers (with subwoofer) and a homemade latte. Yeah, I'm part of the problem. But I am thinking about it, and taking small, easy steps to tread a little lighter and consume a little less. I am firmly resolved that when my current VW Bug dies, whatever replaces it will get a minimum of 40 MPG. My next motorcycle will get over 60, and I'm pondering selling my Honda 919 to fund a bike that gets closer to 90 MPG. I could commute for a week on about 1.25 gallons, or $5.00. Now that's starting to look a little greener. What can you do?